So, it’s another new year and another chance to get our finances in shape. Many people take the start of another year as a chance to make some changes to their financial lives. What are some top ways to make sure that 2014 is your best financial year yet? Here are a few ideas to get you started. You won’t get very far in any year of your life if you don’t even know what your goals are. Let’s start off 2014 in the right way by working out what we want to achieve. Is this the year you want to buy a property, get out of debt or make early retirement a real possibility? To ensure a quality financial year you should make your targets challenging but also achievable. Be sure to choose a goal which really inspires you rather than something which doesn’t get you all that excited. Once you know what you plan to achieve this year you should be able to work out your budget. This is the information which is going to help you achieve whatever your goals are. As with the first point, the key lies in having a budget which is going to stretch to really save but which is also achievable. After you have worked out an achievable budget the next step is to stick to it. Having spent time working out clear goals and a clear budget you should have a higher level of motivation for sticking to your plan. You should also track the budget throughout the year and change it if you feel that you set it at the wrong level initially. No matter what you plan to achieve financially in 2014, paying off your credit cards or loans is vitally important. The interest you pay on these can be a killer to your savings plan. The quicker you get into a debt free situation the quicker you will be able to live out your financial dreams. There are some times when it is necessary to get credit for some reason but paying it off as soon as you can is then vital. If you can get into a debt free lifestyle in 2014 you can then take advantage of this to build up your savings account. This is something which is easy to keep putting off but you need to make the effort to do it at some point. The sooner you get some savings built up then the easier it will be to feel motivated to keep on building them. 2014 could be the year in which you start to put away some cash to help you with your future plans. Finally, we could all do with earning with some extra income in 2014. There are now many different ways of doing this, with the internet being a fantastic source of ideas and tips. If your current level of income isn’t enough for you to achieve what you want to do then this is possibly the most important point of all. By spending just a few minutes on the internet you can find out a number of different ways of earning more money. Once you have a few options to choose from you can work out which one is most suited to your skills and personality. 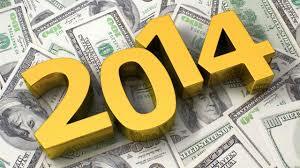 What financial changes will you make in 2014? How did last year’s work out for you? Will 2014 be a year of financial pain or financial prosperity? Last year was pretty good for us — my wife and I got married, we moved to a new town. We took a pay cut for that move, and we still haven’t worked back up to our old income level, but that’s something that we’re working hard to change in 2014. I think the biggest change I’m making is just one in attitude. I’m doing more to try to keep myself accountable and make sure I work towards our goals every day, even if I don’t feel like it. They’re too important to ignore. I’m really looking to boost income this year. Selling stuff on ebay, taking on more freelance writing, scouring craigslist for LEGIT side hustles… bring it 2014! Extra income is definitely my main goal for 2014. It takes a lot of work sometimes, but it really will help us grow our savings much more quickly!